"Though I came to you in tears, I left you with a smile!" Living abroad can be exciting but it can sometimes be scary. In my time in South Korea, I’ve always been greeted with helpful natives. Luckily, my experience with the well trained staff at A Plus dental was no different. Rushing to get ready for my friend’s birthday dinner, I finished the last touches and took a quick step out of my wet bathroom floor, over the lip that lead to the kitchen to leave for the night – or so I thought. Instead, my bathroom slippers decided to give real meaning to their name. As I took a step, both feet flew back and I fell into my kitchen. The fall happened so fast, my arms didn’t have time to react. Unfortunately, my face was the only thing I had to fall on. It was truly a shock but, for the most part, thankfully, there was no harm done to my face. Thank goodness my friends were there to pick up the missing piece of my front tooth and rush me to the Dental Emergency Room. Losing my front tooth was terrifying. I’d had it my whole life. I called A+ Dental Monday morning and they promptly had me come in that day. My first visit was traumatic – mainly because it was such an emotional time and I’m not a fan of the dentist. I was set to be a bridesmaid in America just a month from that time. Fear of the worst took over. However, A+ Dental did their best to make sure I was reassured and comforted through this time. After the first visit, I was more prepared for the work that needed to be done. The dentists, endodontist, dental hygienists, and English Coordinator made sure that I knew what procedure would take place, how long it would take, and updating me on the progress during each visit. Their coordinator was in a similar situation and reminded me of her personal story and the work the A Plus had done with her any time I expressed concerns of doubt or fear. The hygienist was constantly asking me how I was doing, gave me a big smile, and held my hand as I cried. The dentists and endodontist were professional, efficient, and perfectionists with their work. They even fixed the small gap between my front teeth that had bothered me for year. Their in-house lab made sure my porcelain crown was ready for me before my big trip home. Paying for a similar treatment was less expensive here than it would be for me in the States. 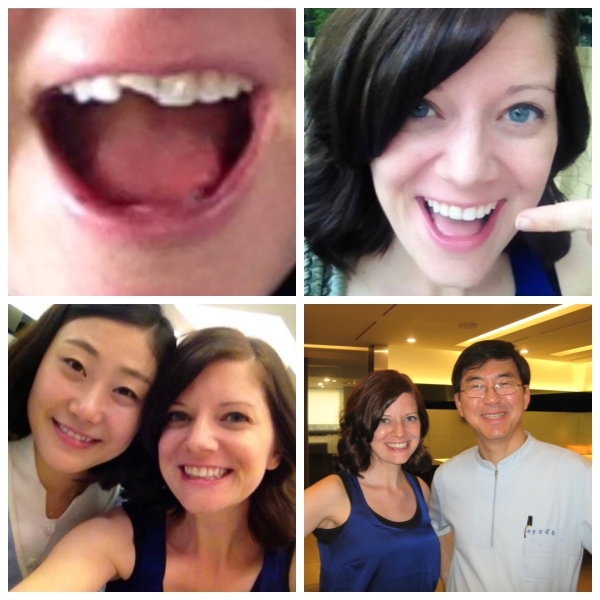 In retrospect, if I had to chip half my front tooth off, I’m happy it happened in South Korea. Overall, A + Dental could not have done a better job handling my dental emergency. Though I went to A + Dental full of fear, doubt, and tears, I left with a smile and was happy to show it off in pictures at my friend’s wedding a week later. Thank you, A Plus Dental!